Have you noticed that when you’re browsing through folders on the Mac that icons are actually previews of images and even live playable videos? This sure makes the OS X Finder snazzy looking, but in some situations where tons of images and video files are contained within single folders, it can have the unwanted side effect of general sluggishness. 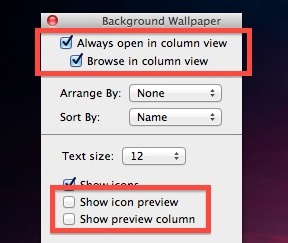 A simple solution to that slowdown is to turn off the image and video preview generation of the Finder, both for icon thumbnails and for the Preview panel that appears in the Column view. This tip isn’t necessary for the average Mac user, but it should be particularly valuable for people who work with very large images and video files as it will offer a nice performance boost to working with any such documents within the Finder. Note that neither of these settings will impact the functionality of Quick Look, letting you still easily scan through pictures but having more direct control over what is loaded and when. In other words, system resources will only be used when Quick Look is activated on the files in question, not simply when opening a directory. This trick alone can offer a significant performance boost to Macs as we’ve mentioned before, particularly for older models, those without SSD drives, or those with less available RAM. Disabling the icon previews is good, but sometimes it’s not enough and sometimes that’s not the cause of the performance issue anyway. For those who use the excellent Finder Column view, the Preview panel column can often be the culprit because it draws even larger live thumbnails of images and videos, and though it may look gorgeous if you have a folder packed full of massive videos and images it’s going to really take a toll to generate these. This tip idea comes as a response to an inquiry from reader Adam G., a photographer who noticed a significant performance degradation on his Mac when looking through folders full of large layered TIFF files. That slowdown is because OS X is actively generating both an icon thumbnail preview of the image and another image for the Preview pane. For what it’s worth, boosting system RAM and upgrading to an SSD drive can improve the performance of background tasks like this considerably. Also, don’t forget to check out our past guide on speeding up old Macs, though many of the tips are aimed at less powerful Macs, they certainly help to speed up new ones too. I would love if the setting to disable icon previews would also apply to the new list view in dock stacks (the view where you can resize icon size with command+ and command-). Unfortunately the only workaround I found is to disable (rename or move) specific Quick Look generators in the system. Now all we need is a way to turn off icon preview in open and save dialog boxes. Will the ‘Show Icon Preview’ preference be remembered over network shares? Might speed up access to a NAS drive or maybe a Time Machine? What’s really annoying about the column browser solution is that it also disable the item information that appears below the preview. Why can’t we have another checkbox that says “Save thumbnails until I request you to make them again”? Then this would only slow down the machine the first time the finder saw each file. I have a folder full of hundreds and hundreds of 15MB stock photos and the thumbnails get regenerated every time I open the folder. That’s just stupid. I just wish they would leave the carrot in the preview again so I can just disable the preview like in previous systems and just have the file creation, modification and version in the preview only. That information is the only information I want in that column not the preview of the file for it will slow down the processing of opening the file and everything else when it tries to generate the preview in the column. My saying is “If it is not broken do not fix it”. The column is very helpful if we can get the carrot back and just turn off the preview but keep the other IMPORTANT info in the column.